Last week went pretty well, menu plan-wise. We didn’t follow the plan exactly, but it was pretty close. I made something different than what was planned two nights, and it turned out that I didn’t have leftovers for Friday, so I went out with a friend instead. Of course, I did post my plan late, so I knew what I was working with for the beginning of the week, but it was still a good week. This week we are settling into the school year routine, and I feel almost like I can handle life again. 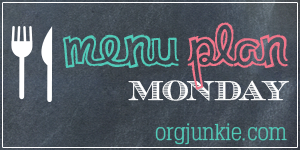 Here look, it is actually Monday when I am posting my menu plan Monday post. I did a big shopping trip to Costco, too, so we have plenty of food–thank goodness for the freezer I bought last month. I’ve only had it about a month and I already can’t imagine how I managed without it! This week is not too crazy, unless I am forgetting something, ;). I have an event to attend during the workday that is near my house tomorrow, so I will work from home an extra day. That always helps with getting things done, especially now that I am taking a pottery class on Tuesday evenings. I don’t think I have anything else to do in the evenings this week besides that class, though–nothing that will take me out of the house, at least. There are always plenty of things to be done. Last week, I hit the beginning of school wall. I thought I was doing pretty well, even with my daughter’s cheerleading injury thrown into the mix, but then a pipe burst in my kitchen sink and I ran out of energy. I did cook dinner most nights, and we got the necessities down, but no menu planning, no blog posting, and not as much Parents’ Club organizing as I would have liked. Cute story: Saturday night, I wasn’t feeling the cooking, but I wasn’t feeling the spending money either (did I mention I had to call a plumber? so expensive! ), so I just made Italian sausages. I asked the boy how that sounded and he told me he didn’t want that. Why? I should also add that I made this menu on Sunday, but didn’t get it posted. I thought about skipping it again and being on time next week, but I need to dive back in or I will never have any menus posted again, I am sure. Okay, that is a bit melodramatic, but the general point is true–I need to get on this now, not keep procrastinating, ;). I know it is Thursday, not Monday–it’s been a rough week. My poor little girl was injured at cheer practice last week–on her birthday. One minute she is texting me asking if she can invite three friends along for dinner, and practically the next minute, the athletic trainer is calling to tell me to meet them at Children’s Hospital. She was back spotting a stunt, and the flyer fell and hit her in the side of the head. They put her in a brace and on a board and she was not a happy camper, let me tell you. Especially when she discovered the neck brace she has to wear for a couple of weeks means no driving test, because you have to be able to turn your head to drive. Not the best 16th birthday, huh? Fortunately, nothing appears to be broken. The boy and I have been catering to her a bit, but she gets a bit better each day, able to do a bit more. She gets very tired, though. She is back at school today, and I expect she will be exhausted when she gets home. I know how she feels, a bit. My neck doesn’t hurt, but I am so tired. We had family in town this weekend, and we did a bit of running around with them, plus a lot of cleaning and cooking to have everyone over on Sunday. The house did need the cleaning (still does need some, actually), so it is nice to have a lot of stuff done, but we were a bit short-handed–the girl did help, but she was limited in what she could do. This week we are back to work and school, but we are glad to be having a shortened week! As always, many more ideas can be found at orgjunkie.com.